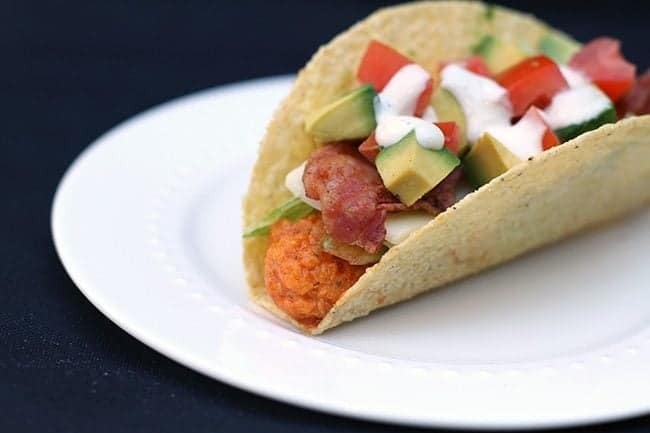 Bacon & Buffalo Chicken Tacos. I’m going to go out on a limb here and say that this is pretty much the best Football Game Day food that has ever crossed my plate. If you aren’t a football fan, then I’m thinking you need to start a Taco Tuesday tradition in your household! Taco Tuesday in our house looks like this taco. I just can’t resist making something new, something crazy, something that’s totally out there that has peaked my imagination. 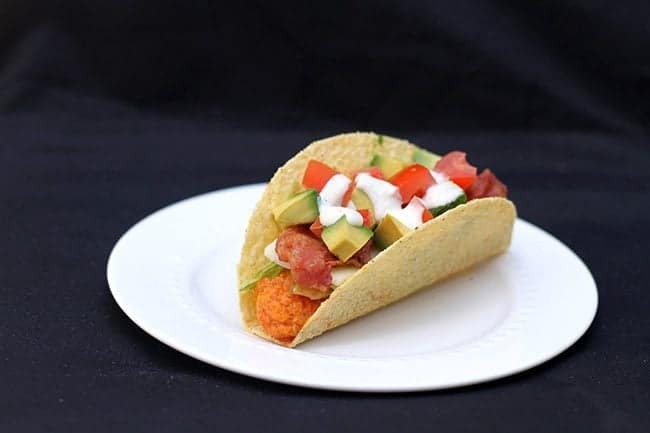 The concept of a taco that has Buffalo chicken wings and bacon in it had been taunting my mind for a few months now. The main hurdle that I had to overcome was the chicken wing itself, bones in simply wouldn’t do. This had to be built as a one bite of paradise kind of food, not one where you fool around with taking chicken bones out first, then putting it back together. So the search for really good boneless Buffalo hot wings began. These were the best thing to hit my belly in months. Sometimes when you are creating recipes and have spent time building them up in your mind, the end result is not what you have envisioned. These were all that and a bag of bacon chips.The possibilities for toppings are endless, my friends. Start with bacon and Buffalo hot wings, do not fiddle around with these. However, play around with the cheese flavors, the dressings and the vegetables of your choice. I want to start watching football and having Sunday football parties now just so I can make these. This is a man-cave meal like no other and the beauty is that it’s so simple to prepare, exactly what a game day recipe should be. You cook up the meat then you let all those game day guests build their own tacos. Winner winner chicken wing taco dinner! IF you want to make these with chicken breast, use my Buffalo Crock Pot Chicken, it’s the best and easiest recipe! 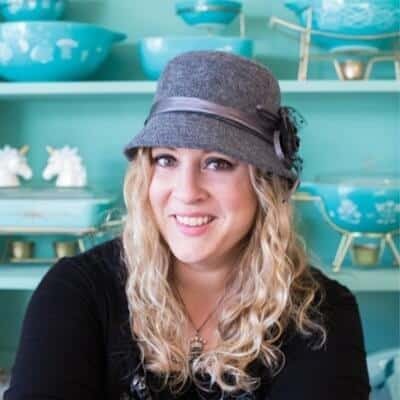 PIN THIS RECIPE to your SUPPER RECIPES Boards and Remember to FOLLOW ME ON PINTEREST! 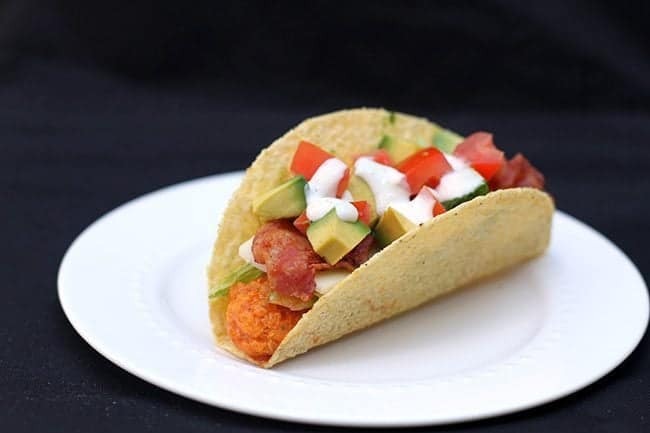 Bacon & Buffalo Chicken Tacos for you game day party! This is a perfect "build your own" party food. Cook the chicken wings according to the package instructions. Set out the remaining ingredients on a table for everyone to prep their own taco. 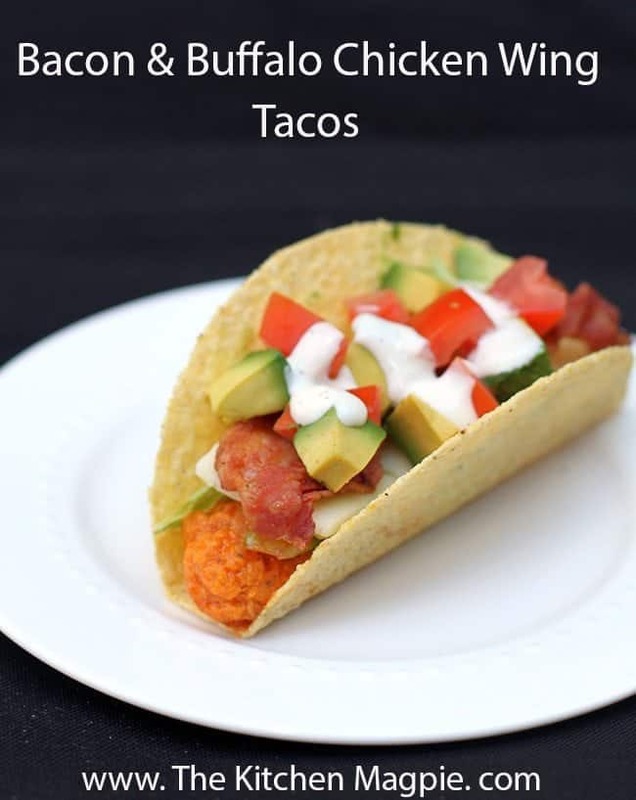 Place a chicken wing in the taco, add cheese, bacon, tomato, lettuce, avocado and top with either ranch or blue cheese dressing. Enjoy! My word these look delish – I love anything Buffalo! And your photos are gorgeous! @JoAnna Thanks!! I love Buffalo too, just as long as it’s not too spicy! Such a great flavor!